A simple theory: all revolutions begin for the want of food. The sansculottes wanted bread; the Arab Spring began when a man protested the price of rice; and if you ask the Chinese Politburo, they do not think Tienanmen Square was about wanting freedom but about protesting high food inflation. The people must eat, and become agitated when they cannot. They come out onto the street when they believe that society is so riven between the ruling class and the people that they have no democratic expression of their discontent. It is a watered down and rather pathetic shadow-play of these concerns that sees protesters camped outside St Paul's Cathedral in London this week. I say all this to show the absolute relevance and importance of Shakespeare's tragedy CORIOLANUS as brought to the screen by Ralph Fiennes with a screenplay adapted by John Logan (RANGO, THE AVIATOR). If that sounds defensive, it's because Coriolanus has typically been seen as a "second-tier" tragedy, ranking behind Macbeth, Hamlet and Lear for complexity and beauty. Typically, critics argue that it isn't truly great in form because it contains so little poetry, so few soliloquys, so little examination of Coriolanus' interior life. There is some truth to this - Coriolanus doesn't spend hours examining his conscience and motives in the way that Hamlet does - but that's completely right for the character. Because Coriolanus is a great Roman general, not a student of philosophy. And more than any other Shakespearean military man, he is a man of action. We see him fight his battles in detail and on stage - each attack and counter-attack - this is what defines him. And because of this, the short, inter-cut battle scenes in Act 1, the lack of standing and "speechifying", Coriolanus is particularly suited to a film adaptation. The medium suits the man. 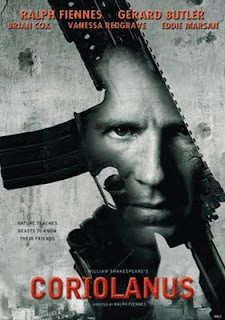 In particular, DP Barry Ackroyd's (THE HURT LOCKER) gritty, hand-held camera-work showing Coriolanus in battle in war-torn Belgrade is not merely a contrivance - an attempt by Ralph Fiennes to contemporarise the play - but is absolutely what the play is about. Coriolanus doesn't soliloquise because he has no self-doubt at all. He knows what he is - a great military leader - and he believes that this is enough to become political leader of Rome. The problem is, Rome itself has changed. The City of Rome of the play has only just rejected its King and become a Republic - events that Coriolanus had a hand in. It is a weak and fragile state, split between the ancient ruling patrician families and the mass of common people. As the play opens, the patricians have conceded that the people should have two tribunes to voice their concerns, and it is these men, whose profile depends on antagonism between the patricians and the plebs, who will motivate much of the action. The meat of the play is how Coriolanus will transition from decorated military leader to politician in this new world where merely asserting one's right to rule is not enough - where one must actively court the masses. He is proud to be a military hero - pride is his great tragic weakness - but resents the fact that he can only be a hero by the acclamation of the common people. After all, he has been raised to believe that the virtuous life of a Roman consists of noble and heroic service to his City and that virtue, as in the Greek model, can only be possessed by a few. In other words, Coriolanus is not a democrat, and refuses to even pretend to play the democratic game. * He resents having to be acclaimed by the people and merely tolerates acclamation by his peers. He sees his enemy Aufidius as his true peer - and in moments of greatest hubris, sees himself as a god, and thus without peers. After all, the gods rule not by courting the people but because they are just better, greater, more powerful. This sets up the central conflict in the play. Coriolanus returns to Rome a hero, and while the common people know that he holds them in contempt, they cannot help but acclaim him leader. However, the new Tribunes stir up the people, exposing Coriolanus' veiled insults, and he can't help but raise to the bait, vilifying them and rejecting them. He takes the ultimate step of abandoning his City - a step which Allan Bloom describes as follows: "What is the good of serving that which is not noble and will not permit him to remain noble?" Coriolanus' tragedy is that he seeks honour, but honour conferred by the people, who are unworthy judges, is tainted. The logical next step is then for Coriolanus to punish Rome by returning with Aufidius, his once-hated enemy, as a military invader. And in this final part of the play and film he casts himself as a god - the logical solution to his problem of tainted acclamation. Logical, yes, but unsustainable, because Coriolanus cannot, in the final analysis, be as cold and merciless as a god. When his mother - the wonderfully written Volumnia - appeals to him to make peace, he cannot resist. In his pity, Coriolanus betrays Aufidius and is punished for it, though in the play (but not the film) he is acclaimed at the end. As I have described it, the play is a purely political animal. There are no tragic romances, personal betrayals, ghosts, witches or madmen that enliven and popularise the other tragedies. It is a play that is pure in its concerns, and because it deals with such a cold man, can appear cold and austere to its readers. Because Ralph Fiennes and John Logan's adaptation is absolutely faithful to the text, I suspect that may well be the reaction to the film as well - all very well-acted and intelligently produced but somehow failing to catch a spark in the audience. After all, with the exception of Brian Cox' voluble, charismatic Menenius, there aren't any characters that ooze human warmth. The majority of players are cool political operators and agitators. There is no romance - when Coriolanus (Ralph Fiennes) leaves Rome, we (and he) barely care that he has left his wife Virgilia (Jessica Chastain). The strongest relationship is between Coriolanus and his mother (Vanessa Redgrave) - an austere woman who sees her role as a mother as one of "duty" not to her son but to her City - to raise an honourable man. I love that Fiennes puts her in a masculine uniform for much of the play, subverting the expression of her maternal pride into something harder, tougher. Accordingly, it is far more powerful when she capitulates and goes down on her knees, begging Coriolanus to make peace. So yes, one must admit, this is not a movie for those looking for human warmth, humour, frailty and subtlety. But it is a film that brilliantly brings Coriolanus to a modern setting, and completely understands its subject matter, deftly condensing it to a two-hour run-time. The battle scenes are effective and take us to the heart of Coriolanus' character, and the set-piece confrontations - particularly between Fiennes and Redgrave - are spectacular. Indeed, in a uniformly superb cast, it is Redgrave that stands out. Most importantly, I truly believe that an audience coming to the movie with no prior knowledge of the play, would follow the actions and motivations of the characters, and respond to the tricks of having, for instance, real TV newscaster Jon Snow, playing a newscaster in the film. More than that, I love how the movie manages to achieve all this while keeping all the iconic lines of dialogue, and goes further, adding layers of visual detail that enrich the viewing experience for those who know and love the play. For example, Coriolanus' dragon tattoo recalls Menenius' line "This Martius is grown from man to dragon: he has wings; he's more than a creeping thing." This seems to me the ultimate success of the film. A great play doesn't necessarily make a great film. One has to use the virtues of the medium - ultimately a visual medium - to enhance the brilliance of the text. And Ralph Fiennes has done this to brilliant effect. CORIOLANUS played Berlin, Toronto and London 2011. It opened in Serbia in February. It opens in Russia on December 1st, in the US on January 13th and in the UK on January 20th. *Indeed, one could argue further that Shakespeare is also not a democrat. The criticisms of popular politics that he gives Martius are entirely reasonable and, indeed, prescient. He predicts the rise of popular politicians like Julius Caesar, who in sharp contrast to Coriolanus conquered Rome because he corrupted the people.